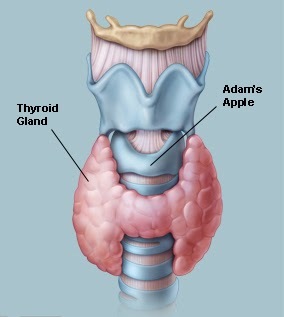 The Thyroid Gland is a butterfly-shaped gland that resides on the lower front of the neck, just below the Adam's apple. When the thyroid is a normal size it can't be felt in the human body. The thyroid is full of blood vessels and its main job is to secrete several hormones called Thyroid Hormones. These act throughout the body to influence metabolism, growth and development, and body temperature. Thyroid Gland is highlighted in darker red. The thyroid gland covers the windpipe from three sides. The thyroid gland produces hormones T3 and T4, which help the body to produce and regulate adrenaline, ephinephrine, and dopamine (all of which are active in brain chemistry). Without a functional thyroid, the human body can not break down proteins or process carbohydrates and vitamins. Thyroid gland problems often lead to weight gain. The Thyroid gland can not produce hormones on its own. It requires help from the Pituitary gland. The Pituitary gland produces a thyroid stimulating hormone. 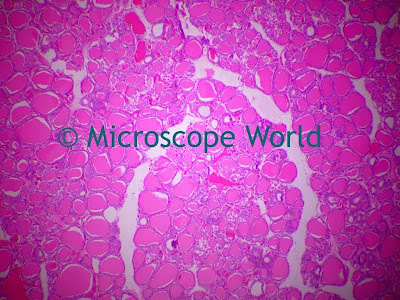 Thyroid Gland captured at 100x magnification. 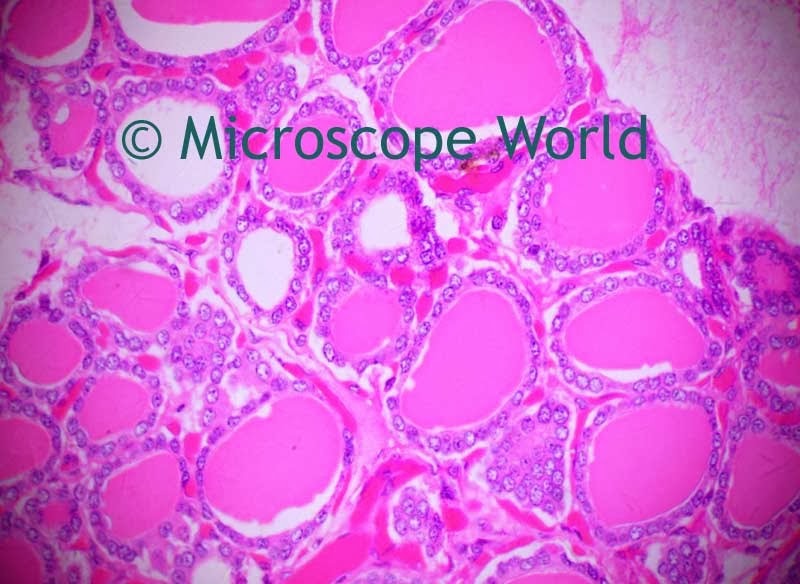 All images of the Thyroid gland were captured at Microscope World using the U2 biological microscope and the DCC5.1P 5 megapixel CCD camera and software. 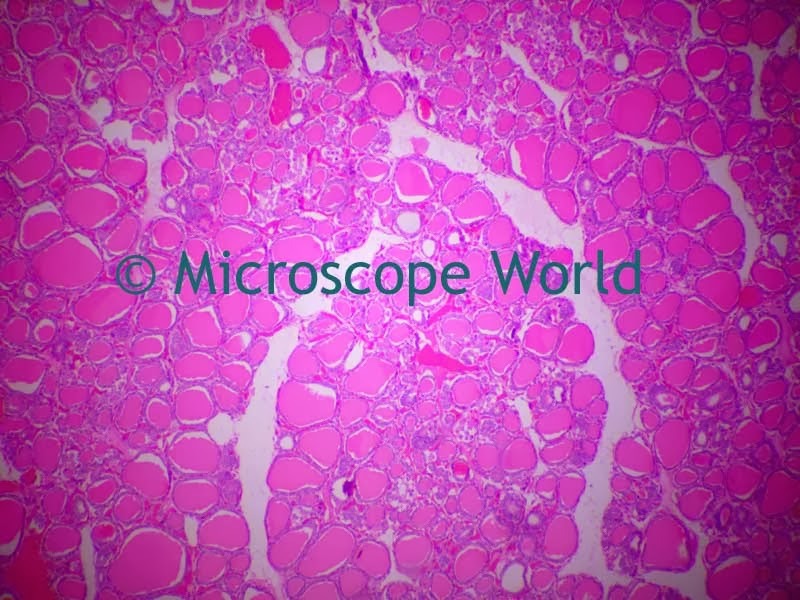 Thyroid Gland captured at 400x magnification. 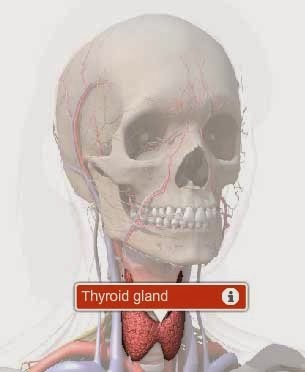 The thyroid gland is one of the largest endocrine glands and gets its name from the Greek adjective for "shield shaped" because of its shape relative to the thyroid cartilage. 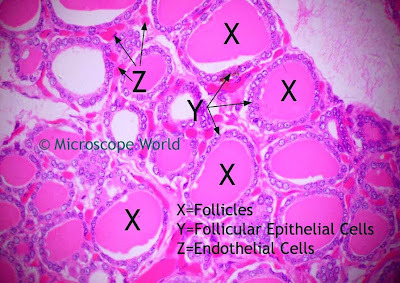 In the human thyroid gland image above the follicles are labeled with "X". These are the follicles that selectively absorb iodine from the blood for production of thyroid hormones. 25 percent of the body's iodine ions are in the thyroid gland. The follicular epithelial cells are labeled "Y". The follicles mentioned above are surrounded by a single layer of thyroid epithelial cells which secrete T3 and T4 hormones. When they are not secreting hormones, the epithelial cells range in size from low columnar to cuboidal cells. They are much taller columnar cells when active. 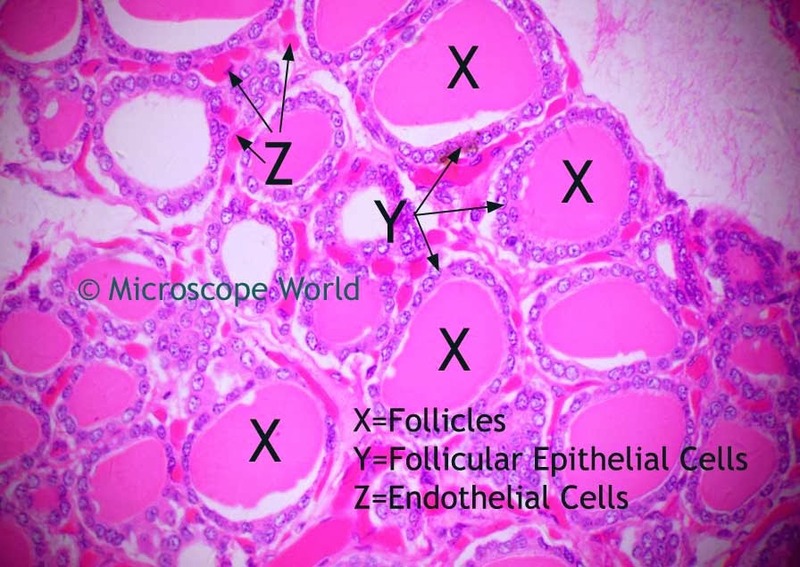 The endothelial cells (very small) are labeled with "Z". These cells are scattered among follicular cells and are found in spaces between spherical follicles. Their primary role is to secrete calcitonin, which acts to reduce blood calcium. 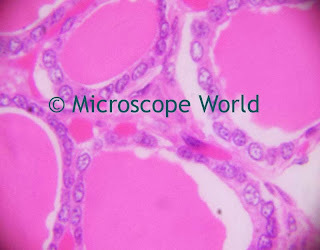 The above image of a human thyroid gland was captured at 1000x magnification. 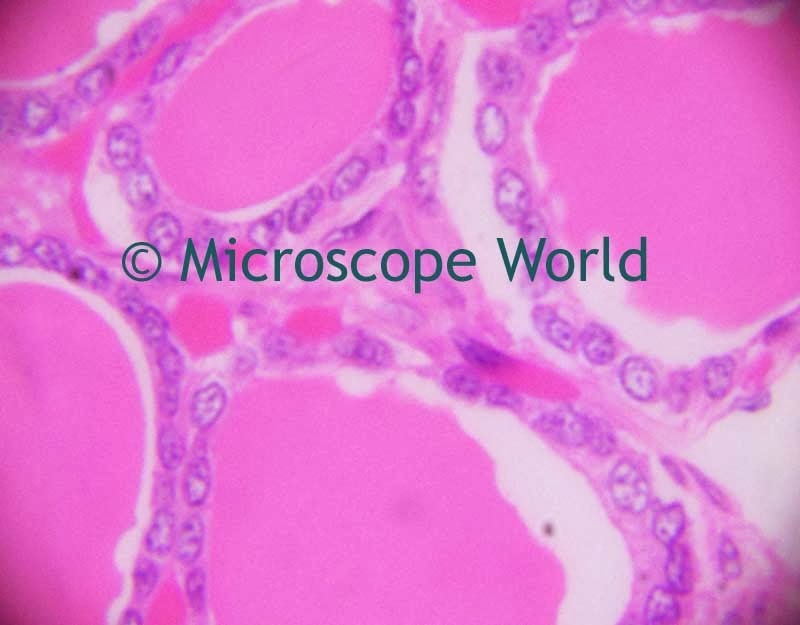 A 100x oil immersion objective was used, however immersion oil was not used when capturing the image (hence the lack of crispness in the image). Whenever using a 100x oil immersion lens, the best microscopy images will always be obtained when using immersion oil. You can learn more about immersion oil here. This article provides more information about achieving the best possible resolution from your microscope.